Many people don’t pay much attention to their district attorneys, let alone realize district attorneys are elected officials, says Ana Zamora, the criminal justice policy director at the ACLU of Northern California. That was the genesis for MeetYourDA. The campaign, which launched today, aims to build power in local communities to hold district attorneys accountable to criminal justice reform and put district attorney races on the map, Zamora said. MeetYourDA, a collaborative effort between the ACLU and Elefint Designs, makes it easy for constituents to learn who their county’s district attorney is and how they stand on certain policy issues. Through the MeetYourDA platform, constituents can easily contact their DAs. The MeetYourDA project came into fruition thanks to a design sprint, dubbed Desgnit, over Memorial Day weekend where a group of product designers from Facebook, Glassdoor and other tech companies volunteered their time to help the ACLU. The sprint was organized by Elefint Designs, which brought together 16 designers and strategists to work alongside Zamora to launch a new criminal justice reform initiative. Without the sprint, MeetYourDA would not have been possible, Zamora says. The site kicks off with a motion graphic narrated by Grammy award-winning artist John Legend. In it, Legend explains what a DA does, how much power they have and how they are the most powerful elected official you probably didn’t know about. District attorneys have the power to decide if charges get filed, who gets the criminal charges filed against them and how severe those charges are. That’s why MeetYourDA wants to empower local communities to hold their DAs accountable. The first step, of course, is to better understand what a DA does. Immediately after Legend’s intro, MeetYourDA presents a concrete definition of a DA. The site goes on to explain just how powerful DAs are in the criminal justice system. When a police officer kills a community member, for example, it’s up to the DA to decide whether to investigate the officer and hold them accountable. In order to build empathy and recognize DAs face tough decisions, the site offers up some scenarios and asks what you would do. The next step is to meet your county’s district attorney. San Francisco’s district attorney, for example, is George Gascón. Thanks to MeetYourDA, we can quickly see where Gascón stands on policy issues ranging from the legalization of marijuana to increased parole chances for some people in prison. The ACLU’s MeetYourDA campaign comes in time for the California primary election in June 2018, when almost every district attorney in the state (56 out of 58) will be up for reelection. 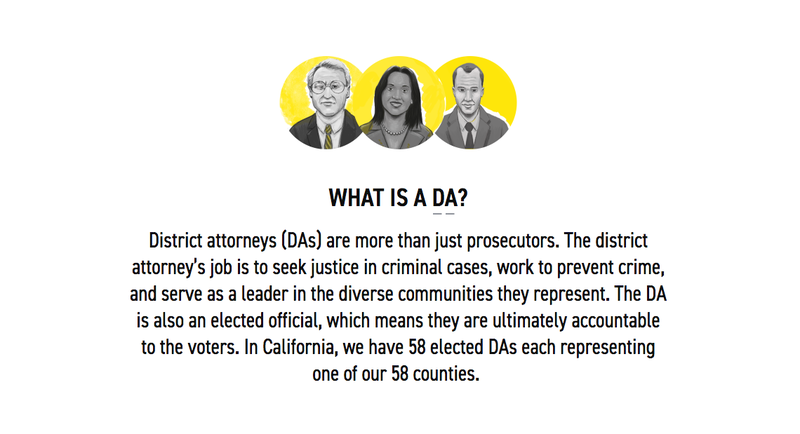 If you live in California, head on over to MeetYourDA to learn more about your county’s district attorney.